Recently I was fortunate to work with the IGIS team in Santa Rosa and Sonoma to explore why so many homes and buildings were lost in the October Tubbs and Nuns Fires. With the IGIS's Shane Feirer we collected drone-based video to record how the fires burned through the vegetation near and around the lost structures. We observed several sites where there was little fire activity in the forests or woodlands, yet the homes burned. This type of video helps us document how devastating a wind-driven ember fire can be and of the important lessons we can learn to be better prepared for wildfire. From this experience I came away with a painful reminder that we all need to do a better job at focusing on fuels near our homes (e.g. combustible wood mulches used in landscaping, lawn furniture, leaf accumulations, dry landscape plants, etc. ), especially in the 5 feet immediately adjacent to our homes. While the Tubbs Fire originated in grassy area in Calistoga it easily picked up embers from the burning vegetation which were moved by the 40-70 mph winds and created spot fires ahead of the flaming front. In short time these embers were blasted into homes via attic or soffit vents (critical to let moisture out of a building) or they ignited combustible materials close to buildings; these types of exposures are the primary way the Tubbs Fire started to consume homes. 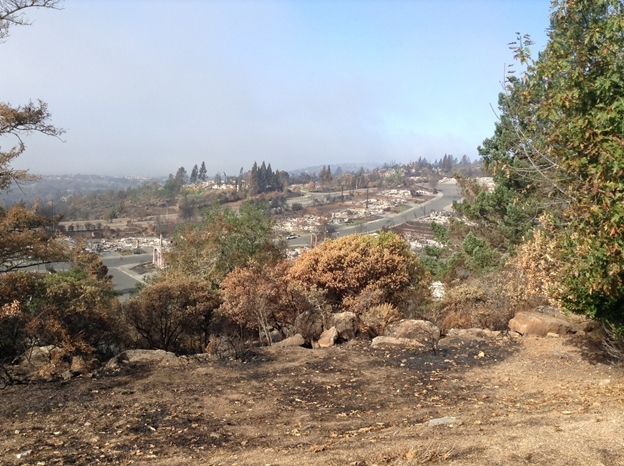 Eventually the Tubbs Fire moved to the more densely populated areas of the Fountain Grove subdivision in Santa Rosa and with each new home that was ignited a new source of embers were created. The embers that came from the burning buildings included 2 x 4s, chunks of wood the size of a frisbee, and other materials. These materials were blasted over Highway 101 on to homes and businesses in the urban center of Santa Rosa- a place most thought could not be impacted by wildfire. The winds persisted till mid-morning on October 9th providing considerable time for an ember to find a weakness in the home. All of us hope we never have a fire like this again, but as history shows us, California's most damaging fires typically occur in the September and October and are often wind-driven. For many years UC has worked in educating homeowners about fire preparedness in the Wildland Urban Interface (WUI). These fires have resulted in the largest number of structure losses to date in California and we all need tools to better understand how to learn from these experiences. I greatly appreciate IGIS's willingness to help me collect some critical data in a time sensitive manner.